Oregon has four managed species of bee pollinators and they work right around the year to make some Oregon's most delicious fruits and seeds. Graphic credit: Iris Kormann and Andony Melathopoulos. Spring has arrived and the bees Oregonians manage are revving up to pollinate some of the state’s most delicious crops this month, including Columbia Gorge cherries and pears, apples in Milton Freewater and Willamette Valley blueberries, blackberries and raspberries. Our state’s beekeepers spent the last month moving their 80,000 colonies of honey bees back into the state from pollinating the nation’s almond crop in California. There is a newcomer in Oregon orchards, the solitary blue orchard bee (Osmia lignaria) that growers have been using to supplement honey bee pollination for cherries and pears. Early Robin cherries grown in The Dalles. Varieties like Early Robin are self-compatible and require honey bees or mason bees to move pollen from a neighboring compatible pollen donning tree (pollinizer) to set fruit. Early Robin is a sweeter than 'Rainier' and relatively firm - a great Oregon cherry! Photo Credit: Molly Alloy. In May and June, honey bees will turn their attention to helping produc the seeds that are ultimately planted across the entire US agricultural landscape. In th Willamette Valley, honey bees help produc vegetable and clover seed, and late in the yea, central Oregon hybrid carrot and onion seed. Honey bee colonies working together with radish seed grower to produce seed that will be planted out across the US. Photo credit: Andony Melathopoulos. June is also time when the state’s massive alfalfa seed crop is produced. Honey bees cannot pollinate alfalfa so a different bee species is needed. 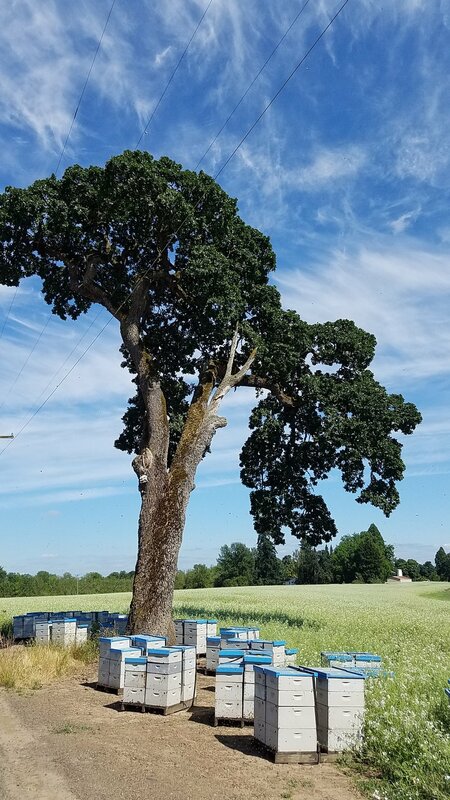 Beginning in the 1950s, alfalfa seed grows worked with Oregon State University to develo nesting beds for the solitary native alkali bee (Nomia melanderi). These remarkable bees remain the only managed ground nesting bee in the world. By the 1960s these same growers also learned how to manage a solitary twig-nesting bee, the alfalfa leafcutting bee (Megachile rotundata), on a large scale. Combined, these two solitary species power the state’s alfalfa seed sector. Look closely and you can see alfalfa leafcutting bees among the cocoons at this managed farm in Eastern, OR. Photo credit: Molly Alloy. Later in the summer honey bees will move to the south coast to pollinate our top-tier cranberry bogs and over to Hermiston to produce the state’s sweet watermelons. Squash and pumpkins round out the season. Orego' man beekeepers are uniquely invested in the success of crops grown in the state. Beekeepers earn over 75% of their income from rental fees paid by growers from over a dozen different crops, the rest comes from honey sales. These rentals are strongly connected with the competitiveness of some of the state’s most delicious crops. Hard working farmers, beekeepers and bees are a key part of what makes Oregon, Oregon. Want to know more about honey bee pollination in Oregon? Listen to the following PolliNation podcast episode with Dr. Mike Burgett.